LONDON, GREATER LONDON, UK, October 24, 2018 /EINPresswire.com/ -- Drugs to treat osteoarthritis, together with analgesics and immunosupressives, were worth $82 billion to the global pharmaceutical industry in 2017, a new report from The Business Research Company, Pharmaceutical Drugs Global Market Opportunities And Strategies To 2021, shows. This part of the pharmaceutical market will increase in size to $117 billion by 2021, when it will account for 75% of the world’s largest pharma market, that for musculoskeletal drugs. The other segments, drugs for rheumatoid arthritis and muscle relaxants, will then be worth $60 billion between them to the drug industry. Many musculoskeletal disorders are incurable so that patients will take these pain- and inflammation-reducing drugs either continuously or periodically for life. As their incidence is age-related, the increase in the size of the aging population is one factor driving the growth of this segment of the pharma industry. Other factors are increasing obesity and stress levels, both of which are becoming increasingly prevalent globally. 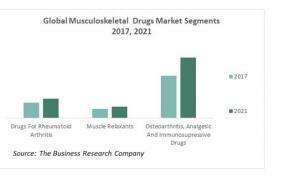 Growth and size make the musculoskeletal drugs market one where huge opportunities are available to the pharmaceutical industry, opportunities that companies can exploit through strategies such as launching non-steroidal anti-inflammatory drugs (NSAIDs) for acute musculoskeletal pain and discovering new indications for muscle relaxants. Pharmaceutical industry data show that the musculoskeletal drugs market is fragmented, with the top ten brands accounting for less than 8% of the total. GlaxoSmithKline, Pfizer, Abbott Laboratories Inc., Daiichi Sankyo and Johnson and Johnson are among the largest players in this market. Pharmaceutical Drugs Global Market Opportunities And Strategies To 2021 is one of a series of new industry reports from The Business Research Company that identify opportunities and explain strategies in over 300 markets, covering over 2400 market segments and 56 geographies. It provides a pharmaceutical industry overview, pharmaceutical industry analysis, past drug industry statistics and forecasts. Like the other reports in the series it also provides market growth rates, market trends, market drivers, market restraints, market revenues, market shares and company profiles of the leading competitors. These industry reports draw on 150,000 datasets. Extensive secondary research is augmented with exclusive insights and quotations from industry leaders obtained through interviews. Market analysis and forecasts are provided by a highly experienced and expert team of analysts and modelers. Markets Covered: Pharmaceutical drugs, healthcare market, musculoskeletal disorders drugs, cardiovascular drugs, oncology drugs, anti-infective drugs, metabolic disorders drugs, central nervous system drugs, genito-urinary drugs, respiratory diseases drugs, gastrointestinal drugs, hematology drugs, dermatology drugs, ophthalmology drugs. Healthcare market segments size and growth for the world, 7 regions and 12 countries. Pharmaceutical Drugs Market Companies Covered: Novartis AG, Sanofi S.A., F. Hoffmann-La Roche Ltd., Pfizer Inc., Gilead Sciences, Inc., Johnson & Johnson, GlaxoSmithKline Plc., Bayer AG, Teva Pharmaceuticals, Merck & Co.
Data Segmentations: Pharmaceutical drugs market size, historic and forecast size and growth rates for the world, 7 regions and 12 countries, pharmaceutical drugs market split by segments (musculoskeletal disorders drugs, cardiovascular drugs, oncology drugs, anti-infective drugs, metabolic disorders drugs, central nervous system drugs, genito-urinary drugs, respiratory diseases drugs, gastrointestinal drugs, hematology drugs, dermatology drugs, ophthalmology drugs) historic and forecast size, segment shares, and growth rates for the world, 7 regions and 12 countries, global competitor sales and market shares. Strategies For Participants In The Pharma Industry: The report explains 43 trend-based strategies for pharma and healthcare, including, for the musculoskeletal drugs market, finding new indications for muscle relaxants. Opportunities For Pharma Companies: The report identifies the global, regional and country subsegments where the pharma and healthcare market will put on most $ sales up to 2022.